This past week of school turned out to be much more mellow than expected. I had most of my nights free from studying so I was able to spend some much-needed time in the kitchen. When classes started in February, I made the decision to eat healthier. Each day I start out by having probiotic yogurt and fruit. For lunch, I pack a small cucumber sandwich smeared with low-fat cream cheese along with a generous portion of raw veggies and more fruit. In the afternoon, I snack on raw unsalted almonds. At night, I have a sensible dinner (this sounds like a Weight Watchers commercial or something) of steamed veggies and some sort of protein. I decided to start this week with a new lunch routine (since people are starting to notice I eat the same thing every single day). 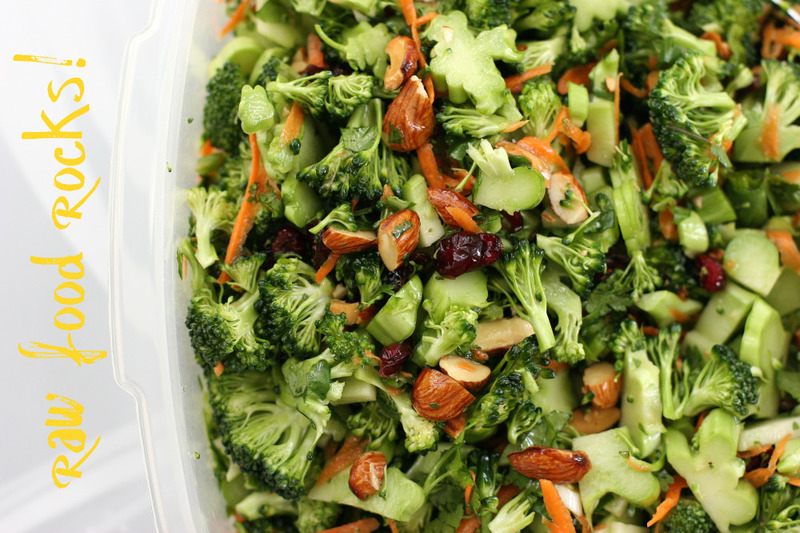 I created a raw broccoli salad with a sesame dressing which is loaded with flavor and nutrition. While I’m not on a raw food diet, I do enjoy eating more raw foods and this salad is nearly 100% raw. The salad is similar to a mayonnaise broccoli salad which I haven’t had in many years. I replaced the mayo with a sesame dressing and threw in a few nuts and dried fruit for texture and added flavor. I couldn’t stop eating it when I mixed it all together and think it’ll get better as it sits (I just finished making it). Within minutes, the dressing started working its magic on the broccoli and it began to soften. It also didn’t look like enough dressing at first but everything began to have a nice sheen. After taking a few bites, I think it was the perfect amount. Add the first 6 salad ingredients to a large mixing bowl. Mix the dressing ingredients in a separate small bowl and whisk with a fork until blended. Pour dressing over salad and toss to combine. Allow the salad to set in the refrigerator for at least 30 minutes so the flavors can get all friendly and combine with each other. It’s even better the next day! The salad is not only good for lunch, it will travel well for a summer picnic or outdoor barbecue as well since it doesn’t have any mayo. It’s also hearty and filling enough for those who are vegetarian. Feel free to make it your own by adding in other shredded veggies or nut/fruit combos. Looks delicious! But I’m confused…where’s the sesame? Haha — I had just published the post and while re-reading it … noticed I had omitted the tablespoon of sesame oil in my recipe write-up. Sorry about that — it’s all updated now! Oh, I was about to point out the same thing! Oh I must bookmark this one. We eat a lot of salads in the summer & love the broccoli ones so this would be a good switch up. Looks deliscious! I’ve been looking for new salad recipes and will give this one a try! that looks really great and very healthy. I love that dressing!! Your description of your diet sounds way too “diet-y” to be Weight Watchers. We eat real food, not salads, steamed veggies and chicken breasts. The last shot of this post is gorgeous! This looks great! I think my kids would even enjoy this one. Thank you for the recipe, you have a great sense of foods/flavors that work well together, I’ve noticed. I’m not sure what the cilanto is. Is it what in Australia we call coriander? I can’t wait to make this salad. Yes – cilantro is the same as coriander. It goes well with the broccoli and sesame dressing! Good on you for making a plan and sticking with it, Allen – I’m behind you every step of the way :) I think I’d eat this in a heartbeat compared to broc + mayo!! This is exactly what I’m in the mood for. Printing out the recipe now. Looks great! I’m going to try it with dried berries and sesame seeds. I love a sturdy salad that doesn’t wilt under pressure;). Yummo! Love the spoon shot. Sounds like a hearty salad. I made this last night and I can’t stop eating it! Thanks for such a fantastic, quick, and easy recipe! This looks yummy! Got the stuff to make it tonight, I cant wait. Just found your site today…love it! The broccoli salad looks delish. Why did you choose Canola oil…instead of olive oil? I avoided olive oil in this recipe because I thought the taste would overpower the sesame flavor. Feel free to experiment though! This looks awesome! And I also need to desperately change my lunch routine because I am also a student trying to eat in a healthful way. Thanks for the lovely recipe!